William Bernstein Company (WBC) is a U.S. importer of gums and resins. William Bernstein started in business by trading a variety of products and incorporated his company in 1947 – close to 70 years ago. William Bernstein was a major worldwide importer and exporter of commodities. William Bernstein opened his first office on Park Row in lower Manhattan (across from City Hall) and remained there until 1989 when the company moved its office to its current location on West 72nd Street on Manhattan’s Upper West Side. Since the 1980’s the company has specialized in importing natural gums and resins. 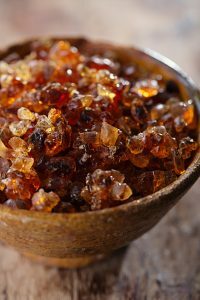 WBC imports a variety of gums and resins products including Olibanum (Frankincense), Myrrh, Dammar (or Damar), Gum Arabic, Benzoin etc. as well as a variety of herbs, spices, and botanicals. What are Gums and Resins? A resin is a viscous secretion of many plants, particularly coniferous trees. Plants secrete resins for their protective benefits. They defeat a wide range of herbivores, insects, and pathogens. Plant resins (i.e. natural resins) are valued for the production of varnishes, adhesives, and food glazing agents. They are also prized as raw materials for the synthesis of other organic compounds and provide constituents of incense and perfume. The terms gums and resins are often used interchangeably; the main difference between the two is in their chemical composition or breakdown. The hard transparent resins, such as the copals, dammars, mastic, and sandarac, are principally used for varnishes and adhesives, while the softer odoriferous oleo-resins (frankincense, elemi, turpentine, copaiba), and gum resins containing essential oils (ammoniacum, asafoetida, gamboge, myrrh, and scammony) are more used for therapeutic purposes and incense.